This is one of the projects that I’ve been working on in my Surfacing E-Course with Diana Fayt. 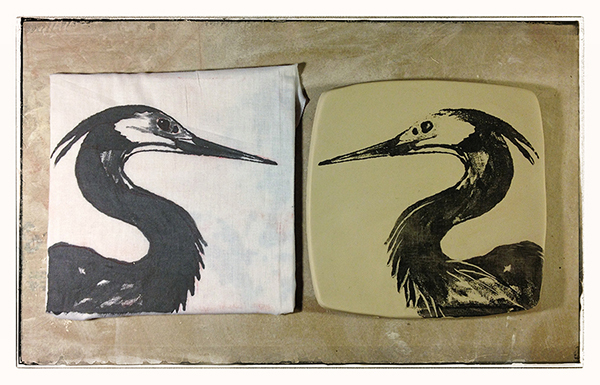 The image on the left side is the “inked” block, and the image on the right is the print it made on clay. Thanks, Anne. Monoprinting has always been a mystery to me – I’m very glad for the instruction I’m getting in my e-course! Thanks, Paul. Now, if only it could make it through the glazing process okay – it’s always so unpredictable. Good luck on that. Assuming we will see the finished product? If the heron comes out half decent, I’ll post it – sure!